Just like the Old West/cowboy theme, I'm sure a lot of photographers come to South Dakota hoping to get some great Native American pictures. There are plenty of opportunities, but it takes a little more sensitivity to the culture. Even outdoors, a zoom lens with a telephoto end in the range of 200-400mm can help isolate individual dancers or details against distracting backgrounds. Model release forms are a must if you are a professional photographer and/or a photographer who plans to sell your pictures in any form. 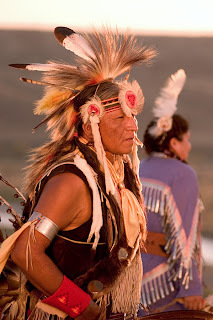 Also do not assume that rules and guidelines you are told at one powwow will apply at every one you ever attend. 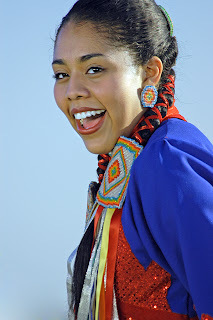 There are some events where photography is not allowed at any time, but most powwows are open to cameras. Almost every powwow has certain times when picture taking is severely frowned upon. The websites above will help you understand and so will talking with the Master of Ceremonies or organizers at an event. Being respectful and in some cases offering to send photos to your subjects can keep you out of uncomfortable situations. 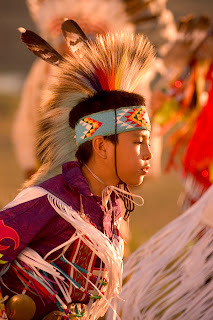 Other hints for the "newbie" - Keep in mind that a powwow is not a stage performance just for show - in most cases it is a combination of competition, tradition, and ceremony sometimes with spiritual overtones. A powwow dancer's regalia is not a "costume" as in something you wear at Halloween or like a character at an amusement park. The feathers, leather, beads, ribbons, etc. are regalia or an outfit, but not a costume. Don't touch people's outfits unless invited to, but do feel free to ask questions about them. A lot of the purpose of a powwow is to educate. Along those lines, have fun at a powwow! When an "inter-tribal" dance is announced, that means everyone can dance. And you don't need to worry about knowing any fancy steps, you'll catch on quickly by watching. Taking pictures while inside the dance circle is not welcome, however.